Orthrosanthus Sweet, Fl. Australas. : t. 11 (1827). Orthrosanthus acorifolius (Kunth) Ravenna, Not. Mens. Mus. Nac. Hist. Nat. 21: 9 (1977). Orthrosanthus exsertus (R.C.Foster) Ravenna, Wrightia 7: 10 (1981). Orthrosanthus laxus (Endl.) Benth., Fl. Austral. 6: 411 (1873). Orthrosanthus laxus var. gramineus (Endl.) Geerinck, Bull. Jard. Bot. Natl. Belg. 44: 38 (1974). Orthrosanthus monadelphus Ravenna, Bol. Soc. Argent. Bot. 10: 317 (1965). Orthrosanthus muelleri Benth., Fl. Austral. 6: 411 (1873). Orthrosanthus multiflorus Sweet, Fl. Australas. : t. 11 (1827). 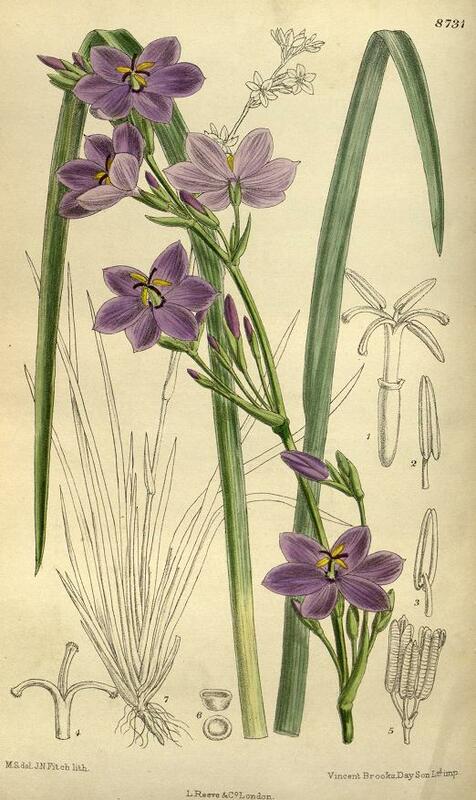 Orthrosanthus occissapungus (Ruiz ex Klatt) Diels in H.G.A.Engler, Nat. Pflanzenfam. ed. 2, 15a: 478 (1930). Orthrosanthus polystachyus Benth., Fl. Austral. 6: 411 (1873).